This unit of work was created in partnership with The Garret and accompanies their interview with Anita Heiss. Please click here to access the Interview, Bibliography, Show notes and Transcript, and Author profile. The following activities and tasks have been designed to be studied and used in full or in part, depending on teacher and student contexts. The activities have been formulated for use with a whole class or small groups; particular groupings being left up to the teacher’s discretion. All activities can be adapted to suit smaller groups or individual students. Activities are generally linked to particular sections of Anita Heiss’ interview, with the relevant portion of the podcast noted at the beginning of the activity. Other activities build upon and engage with the issues raised in the interview itself. This activity relates to 22.10 mins–23.40 mins of the interview. Begin this lesson by locating Wiradjuri country on the Indigenous map of Australia. Explain to students that for Aboriginal people the concept of Country goes well beyond simply describing a geographical area. It covers family and clan ties, language, Creation stories, rituals and ultimately the spirit of a place. 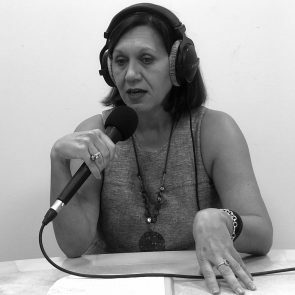 Play to students a section of a podcast (1.50 mins–4.25 mins) on the Aboriginal concept of Country from the Radio National program AWAYE to illustrate the depth of Anita Heiss’ commitment to her country. Heiss’ most recent novel is Barbed Wire and Cherry Blossoms set on Erambie Station, an Aboriginal mission on the outskirts of the town of Cowra in Wiradjuri Country. Read selected excerpts from the novel and discuss with students whether they think that Heiss has successfully captured a sense of her place. This activity relates to 6.30 mins–8.54 mins of the interview. Anita Heiss lists many Australian writers, both Indigenous and non-Indigenous, who have been influential on her writing. However, she especially mentions Ruby Langford Ginibi’s autobiographical text, Don’t Take Your Love to Town (1989), as an example of an authentic record of Aboriginal experience. (See also the Reading Australia teaching unit available for this text.) She states that Indigenous autobiographies have value as ‘our history books’. Provide students with an excerpt from Don’t Take Your Love to Town (e.g. pp. 118–120). Ask them to consider whether they get a real sense of the woman who has written this book and, if so, what elements of the writing have contributed to this? Debate with students the issue of ‘authenticity’. Can only Aboriginal people write about Aboriginal experience? Also propose to students the idea that not using ‘gubber English’ is the writer’s way of resisting the language of the invader. Overall, ask students whether they think that Ruby Langford Ginibi’s autobiography is a valuable alternative to a conventional history book. Write a short account of a memorable event from your own childhood. Reflect on the sort of ‘self’ that your account has constructed. Also, think about what you have chosen to leave out of your account and why you have done that. This activity relates to 16.40 mins–17.10 mins of the interview. Anita Heiss says that when she was at university she noticed that all the books about Aboriginal people had been written by non-Aboriginal people. She says that this has motivated her to ‘write Aboriginal people into the literary landscape.’ She also says that, following the example of Alexis Wright in her novel Carpentaria, she wants to use fiction as a way of dealing with serious issues such as social justice, black deaths in custody and the Northern Territory Intervention policy and practice. structuring the story as a series of episodes rather than in a linear fashion. Students are to re-write a short scene from Kate Grenville’s The Secret River (2005) involving a confrontation between the protagonist of Grenville’s novel, William Thornhill, and local Aboriginal people (see pp. 193–197). In doing so they should experiment with the storytelling strategies that they have discussed. This activity relates to 27.15 mins–32.55 mins and 36.50 mins–40.02 mins of the interview. Anita Heiss says that she begins writing a story with a synopsis of the plot which she can then expand into a final story. She describes her approach to character and setting as ‘immersive’. This can involve her actually taking on the role of a main character for a period of time and also physically visiting the places where she plans to set her stories. For example, she explains how, in order to create the character of Hiroshi, a Japanese POW, in Barbed Wire and Cherry Blossoms, she travelled to Japan to talk to a professor who had interviewed many Japanese survivors of the Second World War. Choose a real-life event from your own life involving a conflict of values or beliefs. Then, write an Author’s note (a synopsis) to explain how you plan to expand this event into a short story, using the conventional shape of a story: Orientation to Complication to Conflict to Climax to Resolution. Identify the audience for your story (Heiss explains that she likes to write for women and Aboriginal people) and explain how you intend to position your readers to make a preferred reading of the story. Write as vividly as possible a description of the setting (the place) for your story. Write at least a paragraph to bring this place to life through appeals to readers’ five senses. Perhaps give the setting a metaphorical meaning to add a degree of subtlety to your story. This activity relates to 40.30 mins–41.55 mins of the interview. Both the interviewer Nic Brasch and Anita Heiss talk about receiving feedback from their editors about covers and titles, their treatment of material (one editor says that Barbed Wire and Cherry Blossoms sounds like Australian propaganda) and even word lengths. the mechanical aspects of writing, including spelling and punctuation. And then use this feedback to write a short story based on your Author’s note and your planning material. A number of other Indigenous writers have also engaged in Anita Heiss’ project of writing ‘Aboriginal people into the literary landscape’. For example, Leah Purcell has taken Henry Lawson’s bush classic, The Drover’s Wife, and transformed it into a stage play in which Lawson’s stock Aboriginal character (‘the stray blackfellow’) is now represented as a ‘real’ human being, the character Yadaka. In his novel Taboo, Kim Scott has created Indigenous characters who have the power to act and to speak in their own voice. The novel contains a short, powerful scene (pp. 219–223) in which Aunty Nita confronts Dan Horton with an Indigenous counter-history of the place where his farm is situated. Alexis Wright’s Carpentaria works within the conventions of the novel form but includes aspects of Indigenous storytelling and language use to make the novel accessible to Aboriginal readers and to resist a white point of view. Alexis Wright’s biography of Tracker Tilmouth, simply called Tracker, is a very different biography from the conventional: comprising the ‘voices’ of those, both friends and foes, who knew Tilmouth well. The overall effect is to create a comprehensive profile of a very complex man. (This book won the 2018 Stella Prize.) See also The Garret interview with her. Finally, Tony Birch creates detailed descriptions of place (see page 12 of Ghost River, for example) to give special resonance to settings for his human characters. There is also a Garret interview with Tony Birch available for students to listen to. Anita Heiss says that she considers Oodgeroo Noonuccal’s (Kath Walker’s) book of poetry We Are Going as a classic. She says that it would be one of the few things that she would rescue if her house was on fire. This task is based upon the poem ‘We are Going’. Duration 4 to 6 lessons including one culminating rich assessment task. John Thomashas been an English teacher and Head of Department (English) in various Queensland high schools over a period of almost 40 years. His last full-time teaching stint was at an independent boys’ school in Brisbane where he worked for six years. He also served for a number of years as the chair of the Cairns District Review panel (English) for the Board of Senior Secondary School Studies. John feels fortunate that his teaching life coincided with major developments in our knowledge about language, literacy and literature, and in particular became interested in Continental literary theory and Hallidayan grammar and how these can be applied in the classroom. John has now entered semi-retirement.